A third place overall, a winner and lots of personal bests for the 22 Spartans at St Neots on Sunday. Spartan CRAIG HALSEY raced round the St. Neots Half Marathon to finish in third place out of more than 1,000 finishers and cut his already impressive personal best by one minute to 1 hour 14 minutes 11 seconds. In her first race as a Spartan ROSIE LYON-SMITH was first female for the club and took seven minutes off her personal best with 1 hour 37 minutes 4 seconds. BRIAN WHITE was clear winner in the Vet 60 category in 1:28:13. On a chilly but sunny and wind free morning JIM BROWN went round his monthly half marathon in 1:46:32. The other Spartan finishers were STEFFAN FORD 1:21:07; JOHN NELMS 1:40:49; MARK GOODWIN 1:41:34; PAUL MAGUIRE 1:42:16; ANDREW SMITH 1:47:21; ANDY PRIOR 1:54:54; JON SYPULA 1:57:48; CAROL PAUL 1:58:13; BARRY KING in a season’s best 1:58:17; ROBERT WRIGHT 2:01:06; MARIA SWIFT 2:03:43; STEPH MAYFIELD 2:07:05 and CAROLINE CROFT 2:11:37. 3 CRAIG HALSEY 1:14:11 79.9% Third overall. PB (1 min). 41. PAUL HEWETT 1:23:14 70.1% PB. 252. ROSIE LYON-SMITH 1:37:04 67.6% PB (7 minutes). 11th FS. 333. MARK GOODWIN 1:41:34 70.2% 6th MV60. 467. JIM BROWN 1:46:32 70.3% 12th MV60. 723. CAROL PAUL 1:58:13 67.0% 9th FV55. SOPH GEORGIOU ran the first Larnaca, Cyprus half marathon with a personal best (PB) of 2 hours 6 minutes 34 seconds. There were about 1000 runners in the half and the weather was a sunny 23C. England won both men’s and women’s team. Individually, YUKO GORDON was 5th (F65) over the 6km swampy parkland course and won the team bronze for the age group behind Ireland and Scotland. She was the second scoring runner for the England team. It was very close, just 1 point between each top three teams. Yuko was happy with her debut run of the Cross Country International considering she had a massive hamstring muscle rupture 5 weeks ago and had only three weeks back in training against advice from my physio and GP. Another eleven Spartans were at Knebworth House for the inaugural Hertfordshire Half. This was on an undulating course with a brutal hill for the last 800 metres. At 1 hour 56 minutes 10 seconds VICTORIA BRETT and CLAIRE HYDE ran new PBs both taking 7 minutes from the time of their last half marathon. Being a Knebworth resident STEVE GREEN had to give the race a try. He finished in 1:30:22. RICHARD SPRINGALL was the fastest Spartan. He was 53rd out of the 2,038 finishers in 1:29:11. MARK COLLINS trimmed his PB to 1:30:37. DAVID SCOTT cut a massive 25 minutes of his PB with 2:05:48. TIM ROBINSON got back to the stately home in 1:52:51. It proved a tough course with many undulations but all the FVS runners showed great determination and grit to get their medal. The Brighton 10K turned out to be a fast flat race in perfect weather conditions alongside the seafront and ANN TRYSSESOONE ran a season’s best 49 minutes 36 seconds. 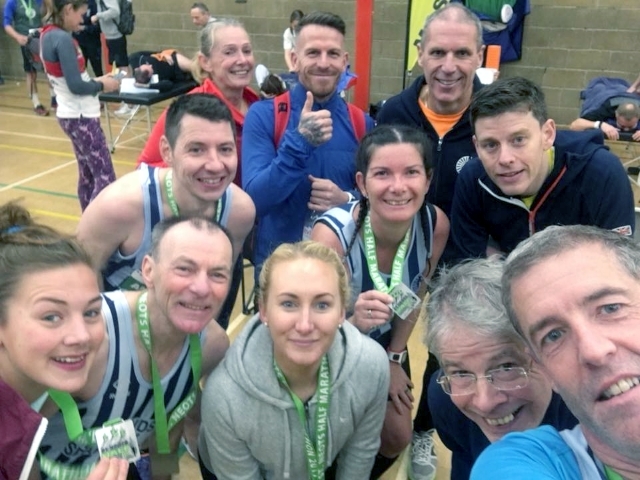 Altogether 34 Spartans ran a half marathon at the weekend. CHRISTOPHER JOHANSEN ran his very first half marathon in a gun time of 3 hours and 15 minutes. He chose the hard inaugural Snetterton Half Marathon. TOM SAUKA did the Peaks South to North Ultra which was split into two days. The first was 30 miles of the White Peak from Ashbourne to Edale which ended up being 53km with a time of 7 hours 7 minutes. The second day from Edale to Marsden which was 45km in a time of 7 hours 17 minutes. In perfect conditions with wonderful views Michael Andrews & Paul Holgate together with wife/daughter Aimee Andrews walked the Shillington Shuffle off-Road marathon through Barton-le-clay, Lilley, Offley, Pirton, Holwell, Stondon, Meppershall and Hexton in 8 hours 7 minutes. Sharon & Mike Crowley completed in 7:29. Aimee’s first time further than 16 miles and Mick’s first time past 21 miles, but training going perfectly for Disney marathon in Florida on the 7th January. ASHLEY SCHOENWETTER finished 8th overall and first woman at Barclay parkrun, Hoddesdon in a time of 22:20 while NATALIE LAWRENCE was third woman at Luton Wardown in 23:03. At Stevenage MARTIN DUDLEY was first Spartan finisher in 22 mins 07 seconds in 32nd place, with MICHELLE REEVES first Spartan woman in 3rd place in 22:15. There was also a new course PB of 22:53 for RYAN DUNNING in 44th place. Highlights elsewhere were a new course PB of 22:35 for MADELEINE PRITCHARD at Beckton where she finished as second placed woman. HANNAH NEALE again improved her PB at Bath Skyline, now down to 23:10, while RICHARD KENNEDY also improved his Nobles course PB to 22:18. Finally two Spartans were in action much further afield with MICHAEL O’KEEFE running his 28:00 close to the equator at East Coast parkrun in Singapore, and PENNY SCHENKEL clearly won the prize for most distant Spartan. She was running in the southern hemisphere at Main Beach on the Gold Coast in Australia with 28:35. 37 30 Michael O’KEEFE 00:28:00 In Singapore! Hertfordshire Five Mile Championship for Veterans and open race at Hatfield on Sunday 26th Nov.